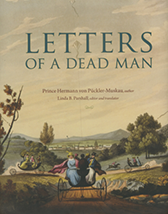 With the publication of Linda Parshall’s unabridged English translation of Hermann von Pückler-Muskau’s of Briefe eines Verstorbenen (Letters of a Dead Man), the Foundation for Landscape Studies, in association with Dumbarton Oaks and Stiftung Fürst-Puckler-Park Bad Muskau, offers the reader full coverage of a great place maker’s “parkomania.” The letters, written in the form of a travel diary to Pückler’s wife Lucie von Hardenberg during an extended tour of England, Ireland, and Wales between 1826 and 1828, draw comparisons that signify Pückler’s insatiable appetite for his ongoing enterprise of crafting the most Romantic landscape panoramas imaginable back home at Muskau Park. In addition to describing the great estates of British lords in their pre-Downtown Abbey glory, they provide delightful descriptions of the manners, mores, and pursuits of all classes of society. It would not be an exaggeration to say that Pückler’s lively style and descriptive powers make Letters From a Dead Man rank alongside the novels of Charles Dickens as a vivid record of mid-nineteenth-century British life. To purchase your copy, please click here.